Medieval Engineers is the latest game from Czech developer ‘Keen Software House’, and it’s now out on Steam Early Access. This is the second “Engineer-game” they have put out on Early Access, the first one being the largely successful ‘Space Engineers’ which by last October had sold One Million copies after being out almost a year on Early Access. This initial release on Early Access will focus on the core mechanics such as building in creative mode much like Space Engineers initial release, as well as the physics simulation, destruction and structural integrity systems. Mods and Steam Workshop integration is next up on the list, and after that Keen SH wants to try to update the game on a regular basis, as they have done with Space Engineers. And in the case of Space Engineers, the game is still receiving weekly updates for the foreseeable future. “We are inviting everyone to join Medieval Engineers on Early Access and help us create the game that you have always been dreaming of!” said Marek Rosa, CEO and founder of Keen Software House. “Last week we decided to open a 24-hour pre-launch window so players could buy Medieval Engineers and get their hands-on the game even before its official launch on Steam. This led to an explosion of creations and engineering designs. We are amazed by what players have already created in just one week! So far we have seen amazing medieval castles, palaces, beautiful houses and whole villages, a multi-point crane with lift, a catapult for three projectiles, cable car and monorail, battering ram, rope suspension bridge, gates, trucks and even a medieval robot – all made out of the building blocks available in the game”. I own Space Engineers and I’ve clocked 100+ hours of it, it’s one of those games that can be extremely fun and interesting if you either have funny people to play with, or you are one of those crazy talented people who can build gigantic fortresses/space stations and the likes. Or I guess if you have both, me and my mates usually build inappropriately shaped spaceships and the laugh as stuff “accidentally” blows up, but maybe that’s just us. 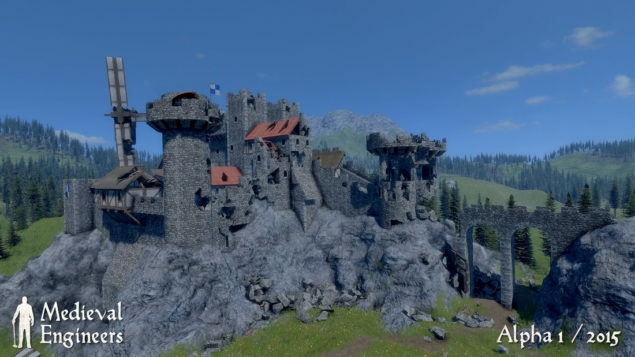 Either way, if you enjoyed playing Space Engineers you might enjoy playing Medieval Engineers. I’ll probably pick it up myself at some point just to see if I can build some crazy Medieval siege equipment.